Last weekend was not much of a weekend for people who aren’t so into riding their bikes around in the rain (hi), so we didn’t kick off our coffeeneuring until today, when we hopped on our bikes and rode to Slipstream in Logan Circle for brunch and some very fancy coffee. //embedr.flickr.com/assets/client-code.jsWe each had two cups of coffee. Both of us tried the Six-One-Six filter, which is the house blend. Quite good! 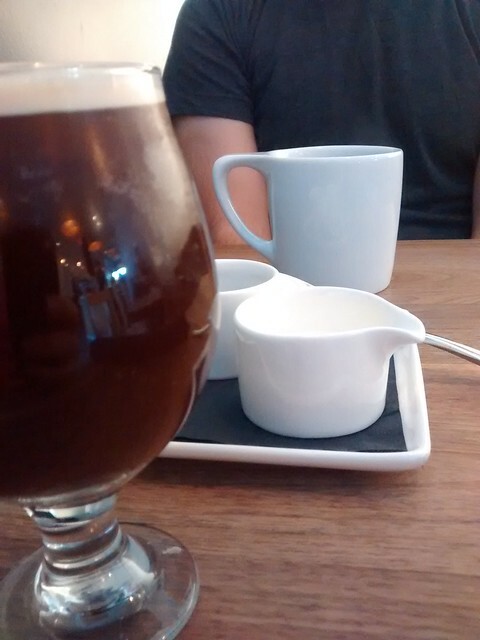 I also had a nitro iced coffee – coffee infused with nitrogen and pushed through a tap. As you can see, this gives it a bit of a foamy, creamy head and a really intersting taste and texture. If you’re at all curious I recommend trying it! 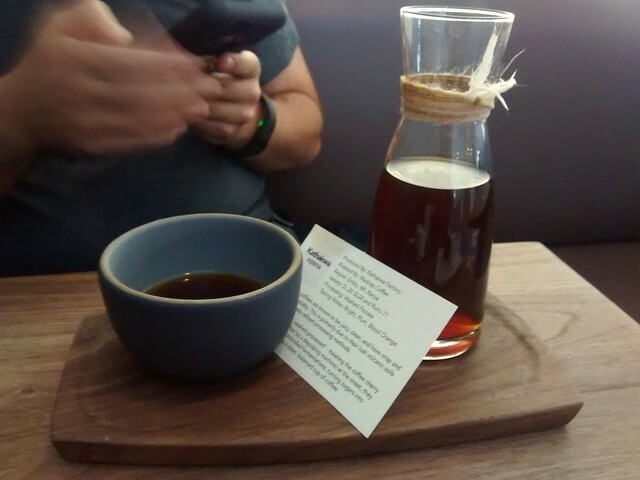 Dave also tried one of their single-origin coffees, Kathakwa. That was excellent, some of the brightness and bitterness of citrus, and very enjoyable. That came with a particularly nice presentation. The ride was just short of 5 miles round trip. We hopped on the Metropolitan Branch Trail at M Street and took that up to R Street, and sailed along in the R Street bike lane until 14th. We had some confusion as we forgot how far down 14th NW we had to go, so we walked our bikes partway on the sidewalk and used the 14th Street bike lane a bit as well. To get back, we zipped up to the Q Street bike lane and then went down 7th Street to K Street, in order to stop at BicycleSPACE. (We both got some new lights, Dave got a shiny brass bell, and I also got some new fenders, which Dave managed to attach to his Vaya backpack/pannier and carry home for me.) After we stopped, we continued up K street and turned onto the First Stree NE cycletrack. This particular route has lots of bike infrastructure – in addition to the trail and the cycletrack, we had some sharrows and lots of time spent in bike lanes. The 7th Street bike lane disappears when it crosses N Street, and then K Street has a mix of lanes, sharrow, and a few spots where there isn’t anything. Overall that was fine, though I don’t know how much I’d want to do that during rush hour!